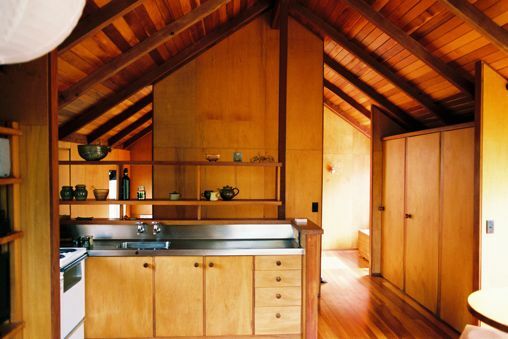 In the early nineteen seventies Bruce and Estelle Martin found ten acres of cut-over bush on the West coast of the South Island between Hokitika and Ross and asked John Scott to design a bach they could build themselves. The bush house was built in the summer of 1974/75, the concrete foundation poured just before Christmas and the shell completed by the end of January. 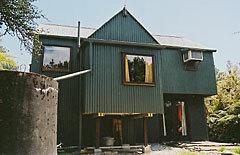 Most of the timber was sourced from the mill at Ruatapu a few kilometres around the road, with the joinery made in Hokitika. 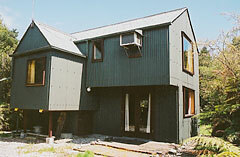 Scott was always intrigued by farm buildings, and he has used the shapes and materials of the rural shed in the Martins bach. 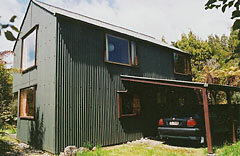 Corrugated iron is a cheap, resilient and functional material with strong roots in New Zealand pioneer and rural culture. It is honest, unpretentious stuff. While not a big job for Scott, he put lots of thought into this bach and he went to extra effort to provide detailed drawings to enable Bruce to build it. The shower and toilet are between floors at the landing halfway up the stairs. 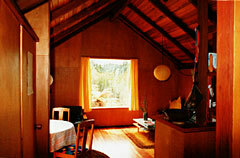 There is a bedroom, sitting room and kitchen area upstairs. Again Scott has got the proportions right. The windows, the internal walls, the light, all carry his signature. It is a wonderful and peaceful place for a holiday, even when it rains!